Star ruby is a double phenomenon gemstone. Along with the beautiful color they have a six ray and sometimes a twelve ray star. The most valued star ruby are from Myanmar (Burma) that are translucent in a pure spectral red with a tint of blue, "Pidgeon blood red". The quality of the star is also an important factor. A well defined star that has good play of movementis also a factor. The star asterism is created by light refracing of the rutile (silk) impurities in the crystal cut in round or oval cabochon. Unfortunately for star ruby collectors transparent faceted ruby is valued at much higher price. Most of the fine grade translucent ruby crystal that could produce fine star ruby is heated to 900 to 1400 degrees melting the rutile or silk producing transparent crystals that are then cut and faceted into gems. Some due make it to the market. 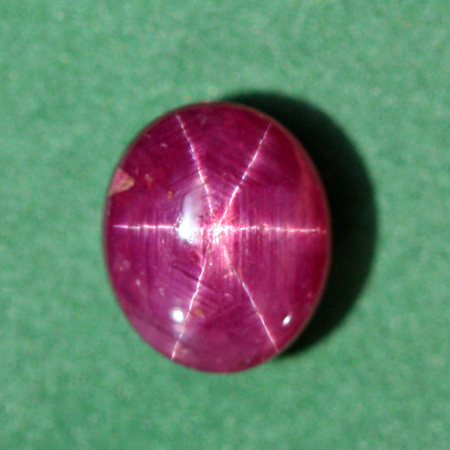 There is a star ruby from India that is opaque to translucent that produces a fine star asterism. The colors range from a purplish maroon red to a slightly brownish red and are priced quite resonably for a double phenomenon gemstone that is a very hard and durable gemstone. Beautiful 6 ray star. Fluorescence in ultra violet light. CLEARANCE!! !